Genea-Musings: "I Understand You Do Genealogy Research"
I was talking to my friend John in the church pews two Sunday mornings ago before the service, and a friend came by with a youngish 95 year old woman who made that statement. It turns out that she was a World War II widow whose husband had been killed in Europe and was buried there. After he died, she received some benefits, moved to California from Pennsylvania, and got married again, and the benefits stopped. She's a widow again, and wanted to see if she was eligible for benefits, but she had lost all of the records she had before the move to California. Apparently, she needs the Service Number of the soldier. Her daughter had looked online but had not been able to find it. Would I help? How could I resist? She wrote down some details for me. On Monday afternoon, I spent an hour using the online resources on Ancestry and Fold3, and easily was able to find the Service Number. I found a lot more, of course, in the process. 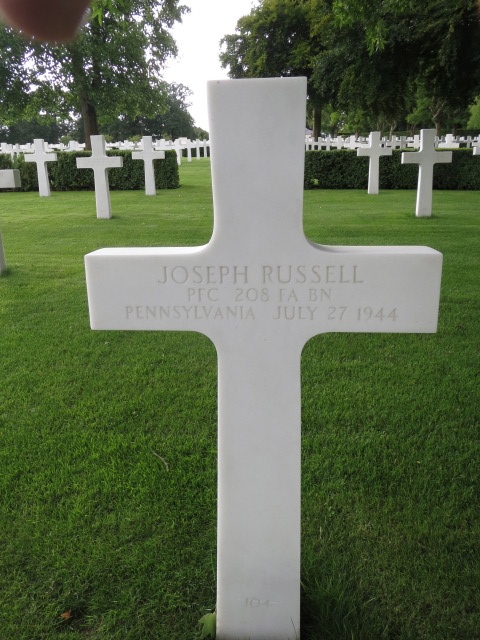 * The Find A Grave memorial for Joseph Russell, buried in Cambridge American Cemetery and Memorial in Coton, Cambridgeshire, England. I'm sure I could find additional records if I searched longer. I don't think that he is in any online family tree. I called my new friend and gave her the good news. She wrote down the Service Number. I mailed her a copy of all of the records I found today. I hope that they help. My guess is that she will be back - probably asking for a 1943 Pennsylvania marriage record for herself and her first husband. That will be more of challenge, I think. This only took one hour to process because I had the resources at hand and knew how to search them (although I struggled with Fold3!). It made a new friend happy and that is a good thing. It made me feel good about helping someone else with their problem. A win-win-win in my book! FamilySearch also has images of Pa. marriage records from 1885 to 1950 or so. Some are especially rewarding, with images of divorce decrees from earlier marriages, too. Nice one, Randy! I've found that these sort of acts tend to stretch out, and to multiply. As hard as it is to say 'no', sometimes there just aren't enough hours in a day.